This is the story of me. I will write more when the blog is set up. Currently, the design using the Somali flag with the word or name “SOMALIA” underneath in the colors (or colours) of the flag is only available at ink.flagnation.com. Soon, it will be on other PODs, but for now, this is it. First up, we have a man’s baseball jersey with blue sleeves and the Somali flag design as described above. To purchase, click the picture or here. Next, we have a iPad skin for your computer needs, allowing you to share your pride in your ancestry, culture and heritage. Perfect for school or work. And, lots of fun, too. To buy it, click here or on the picture underneath. For the women, we have a pink organic tee with the flag design we have been chatting about today. Lovely anytime and anywhere, but great remembering home. To buy click the picture or here. If you are looking for the “his and hers” look, try this ladies Raglan to match the men’s baseball jersey. It also has blue sleeves and looks lovely. You can buy it by clicking here or on the picture. And that’s all for today, folks! Today, a horrible thing happened in my country. Someone set off a bomb and killed two people (as of this blog posting) and injured countless others. Everyday, I must work. We all must. But my heart, today, is not in it. I have tears in my eyes and I only want to scream at the evil people who think they can get their way or make a point by taking someone else’s life or injuring an innocent child. I do not want to speculate on who or what (truly “what” is the more applicable term) would do such a thing. Early reports on these types of things are seldom accurate, and I do not wish to spread rumors that may make a bad situation worse. But work I must, even if I cannot find it in my heart to create a new image for sale or write a tweet or blog about something else. So, today, we will just look at designs I created that use the USA flag and make me feel that I can honor the innocent in some way. Today’s blog post is dedicated to those that were injured or killed in Boston. Please pray for them. Yes, you can buy these designs. Just click on the image and it will take you to the product. This design is only available at ameriwear.flagnation.com or www.zazzle.com/flagnation/gifts?cg=196981339879944345. The design above, or a similar angel, is available in all most of my shops, zaz.flagnation.com, ink.flagnation.com, and ameriwear.flagnation.com. The design below is also available in the same shops. Please pray for the people of Boston. I love making these designs because they are a bit out of the ordinary. Rather than just the flag alone, I add the name of the country below, and color (or colour) the word to match the flag. It is time-consuming to make, sometimes, depending on the flag, but it is fun to do and a bit creative. Today we will look at four such designs on a Men’s Deluxe Hooded Sweatshirt. The hoodie is USA made and printed. To purchase click HERE or on the picture below. Next we have Colombia, with matching flag and name. Just for fun and to share lots of pride in your heritage, too. This design has no border on the letters or the flag. To purchase, click on the picture underneath or HERE. Our next adventure takes us to Jamaica, where both the flag and the word are surrounded by a grey border. That’s the only way the black parts of the flag will show on a black hoodie! To buy this lovely item, click on the picture below or HERE. Our last adventure takes us to the Seychelles. Whether you are Seychellois or just love all the beautiful colors (colours), this will always be fun to wear. It is one of my favorites. To purchase, click HERE, or on the picture below. St. Patrick’s Day will soon be upon us, so I thought it would be fun to share a few more of the shamrock flag designs. They are great fun for family reunions, and just for celebrating your American, Irish and (insert other ethnic group here). These are all found at flagnation.com. All design are available on many, many products, so you can find just the right thing. 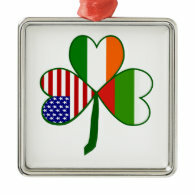 First up, we show the English Shamrock, with the flags of USA, Ireland and England. This is the one President Barack Obama would wear, as he is of both Irish and English heritage on his mother’s side. Although, he would probably prefer a tee shirt or tie instead of the lovely necklace below. Next, we show playing cards for family fun. These show the Australian Shamrock for those whose Irish ancestors came to the USA via Down Under. Again, to purchase click on the picture. Third, for the USA’s neighbor to the north, Canada, we feature the…you guessed it, Canadian Shamrock. And, yes, it shows the Canadian, USA and Irish flags. So, whether your ancestors came from Ireland and went to Canada and then the USA, or vice-versa, this works for you. Again, to purchase click on the picture below of the lovely candy jar. Lastly, we see a T-shirt with our Japanese Shamrock, with flags of USA, Ireland and Japan. And, yes, you can buy it by clicking on the picture. Happy St. Patrick’s Day and HAPPY SHOPPING! Because I love them, I started making shamrocks with a different flag in each leaf. The USA and Ireland are always in the design, but the third leaf changes with each country. Why did I do this? Because while I am very proud to be an American, I also have Greek, French, Dutch, German, Scot, and, of course, Irish lineages. And in America this is not unusual. So, I created a design that allows people to honor three of their ancestries at once. First up, we have a Greek shamrock espresso cup. Lovely for your Greek coffee, even if you choose to drink it on St. Patrick’s Day. Click on the picture to purchase it. Next we show a teapot with the German shamrock. Lovely way to drink your tea. Last, we show a terrific tie with a French shamrock. Wonderful to honor all your ancestries (or three of them anyway) on St. Patrick’s Day or anytime. Fun for Bastille Day and 4th of July, too! A while back I opened a shop at Wordans, and just sort of left it. I’ve been adding designs to it the last few days, so I thought I would let you know about it. These are a couple of the products in the shop. You can buy the items by clicking on the pictures. 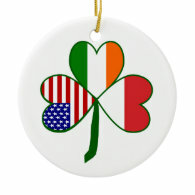 Fun design features an Italian Shamrock with flags in the leaves of Ireland, Italy and the USA. Next we have a black tee shirt with a fun Canadian angel on your shoulder or sleeve. Let her watch over you! As St. Patrick’s Day approaches, I thought we could look at a few designs I created using the shamrock motif. These shamrocks all have three leaves, of course, and in each leaf is a different flag. Two of the countries are always the same, those being the United states and Ireland. the third country varies from shamrock to shamrock. Below are four examples. This blog post is an experiment of sorts. I found a “helper thingy” for posting. It creates some of the code for me and makes it look nice, too. I thought I would try it and see how it works. So far, so good. The person who created the “helper thingy” also designs items and asks that if I use it, I promote one of their designs. This is easy because I can use the handy-dandy “helper thingy” for this, too. I chose this particular design because some people who enjoy my images like to travel and travelers often take pictures. They also need key chains to keep their keys on so they have them handy when they arrive to back at their own home, all worn out and needing to get back into said house. Today we are going to look at a newer shop. There are not many designs in it as yet, I just opened it a few months ago and it takes a long time to get all the designs in. You can see the entire shop by visiting here. The company, estoremonster.com, is located in Canada, so our first design shows both the British and Canadian flags on a women’s tee, with the words, “British by birth Canadian by choice”.Fun design for those who were born in the UK and now live in Canada. Click on the pictures to make a purchase. Next up we show a black hoodie with the Canadian flag and the word or name “CANADA” below in snow-capped lettering. Lots of fun for travelers and natives, too. Finally, we feature a 3/4 length sleeve baseball jersey with a design showing the Irish flag and the word or name “IRELAND” underneath in the colors (or colours) of the tricolor. Hope you enjoyed our trip today. HAPPY SHOPPING!